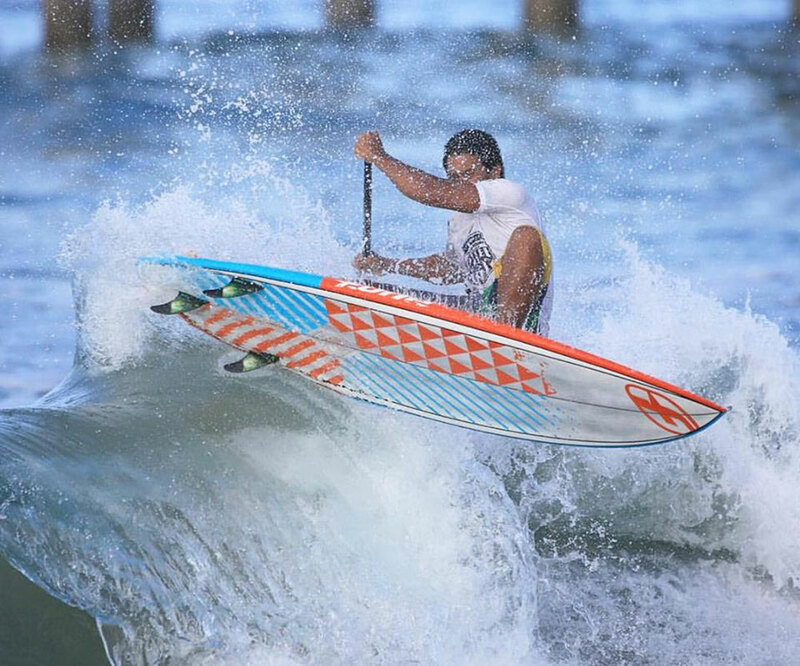 Caio Vaz (Art in Surf) was in the final back in 2012 when Leco Salazar (New Advance) won his World Title, so felt the emotion and excitement of being able to bring a World Title home to Brazil. In 2013 and 2014, Caio stepped up his game, consistency and performance surfing to battle it out two years in a row with 4x World Champion Kai Lenny (Naish) for the crown, both years being so close, but having to settle for 2nd. But this year was to be Caio Vaz’s year, as he methodically posted finals results and put on some of the most impressive surfing of the year in all forms of conditions, from wooly Sunset, to small clean Sunset Point, to barrelling lefts in Tahiti and then of course to the small, technical surfing that was the order of the day here at the US Open. 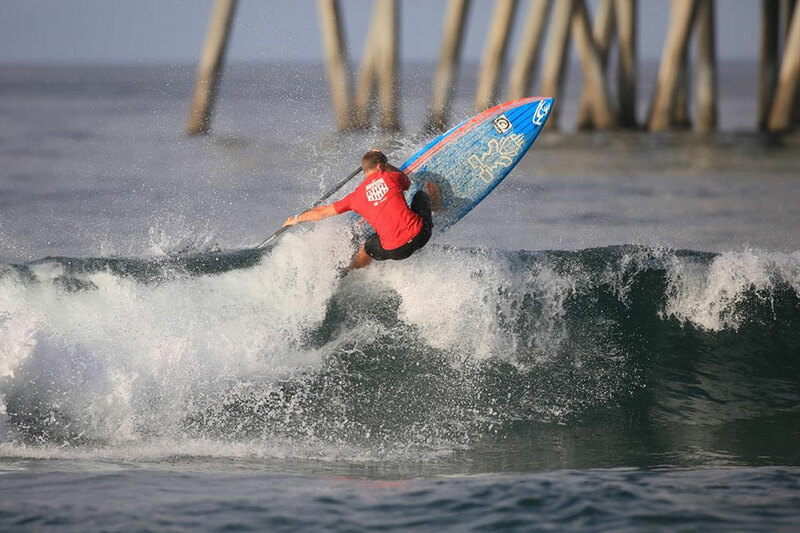 He has proved himself and then some this year, and has been one of the on form surfers at every event. 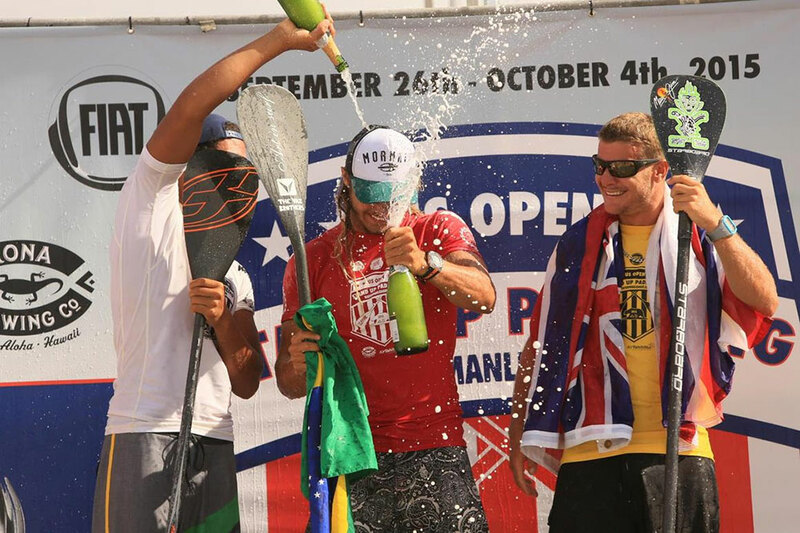 This year’s Title was one of the most fiercely contested yet, as while it was Caio and Kai battling it out to the bitter end in 2014, in 2015, there were 5 people all within striking distance, with Zane Schweitzer (Starboard) equally poised for victory with a World Championship Win in Tahiti counting towards his scoreline. Caio’s laid back attitude disguises a competitive animal within, as he maximized every wave score and posted strings of excellent scores throughout the contest, overcoming America’s Sean Poynter to make it through to the Finals. It all came down to whether Zane could make the Finals or not to see if it would be a final battle for the Title, something that in the end, wasn’t to be, as Caio was able to secure the World Title prior to the Final heat of the year. So a huge Congratulations goes out to a phenomenal athlete and worthy World Champion, as Caio Vaz brings the 2015 World Title back to Brazil. The official World Title Awards Ceremony will take place back at Turtle Bay in Feburary prior to the 2016 Sunset Beach Pro, but it is already Official, Caio Vaz is your 2016 World Champion! Zane Schweitzer (Starboard) had an incredible year in 2015, putting on a stellar performance at Sunset, especially in the early rounds when the conditions were pumping, putting on a masterclass of performance surfing on his backhand. He then went on to Tahiti, to navigate his way to a well deserved victory at the Sapinus Pro, an event that saw epic surf and Zane step his performance up a notch to put him the running for a World TItle in 2015. Coming into Huntington, there is no secret that Zane is one of the most progressive stand up paddle surfers in the World, and his radical approach to surfing in punchy beach breaks is well known. This skill and his new found focus this year brought him all the way to the semi finals where he met with the Tahitian phenom Poenaiki Raioha (F-One), a heat that if he won, would bring it all down to a dramatic man on man Final with Caio Vaz to decide the 2015 World Title. Unfortunately for Zane, he was unable to find the waves he needed to get the scores required to overcome the young Tahitian talent, ending Zane’s Title hopes for this year. However, one thing is for sure, while Zane has always shown that he has the talent to win a World Title, this year he has demonstrated a new focus and competitive drive that is undeniable. There is no doubt that he is disappointed to not walk away with the Title in 2015 having come so close, but there is also no doubt that a Title is well within his grasp and he can draw real confidence from his result this year, a 2nd place overall and the fact that he has the ability to win against the best of the best. Poenaiki Raioha (F-One) is still only 17 years old, but has an extraodinary talent and is now backing it up with contest savvy to make him an incredible dangerous player on Tour. With a solid finish at Sunset and in Tahiti, he stepped it up a notch at the US Open to take his first victory on Tour that propels him to 3rd overall for the year. In one of the most competitive year’s to date on the World Championship Tour, this is an incredible achievement by the young Tahitian. The World Tour was launched back in 2009, in Tahiti, with the World Tour Contenders, as a core group of Tahitian stand up paddlers then stepped up to follow the Tour over the first few years: from legend Arsene Harehoe and Vetea David, to leading ambassadors Guillaume Bourligueux, Tama Audibert (Starboard) and Patrice Chanzy (F-One). However, this past year has seen a changing of the guard, as the new wave of Tahitian talent is taking over, with Poenaiki leading the charge. Behind him are a whole host of talented young surfers like Nainoa David (Naish), Tehotu Wong, Nats Teriitahi, Rangitea Bennett and of course Poenaiki’s younger brother Mauiki. It is an exciting time for Tahitian Stand Up Surfing as the propsects of crowning a World Champion from this beautiful island chain are real. Izzi Gomez (Starboard) continues to go from strength to strength, and is a leading light for women’s Stand Up Paddle surfing. In what has been the most fiercely competitive years on Tour that saw the level of surfing amongst the women sky rocket, Izzi was able to maintain her composure and stay the course to secure her second World Title in 2015. It was no easy feat for Izzi, with 4 girls in the runningthrough the early rounds, and a costly mistake in the 1st round, relegating the young Champion to the repechage. 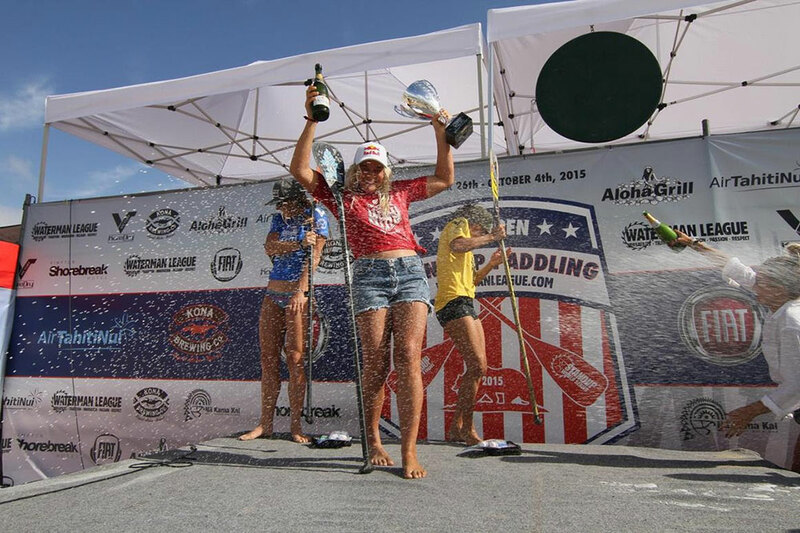 However, she was able to fight back and march her way through the rounds to take the win here at the US Open of Stand Up Paddling, a win that was enough to secure her the 2015 World Title. There is no doubt that the role that Izzi is playing in women’s stand up paddling is similar to Kai Lenny’s (Naish) in the early days, where their progressive and forward thinking approach to surfing helps to drive the sport forward as a whole. It is exciting times for the women, as the field becomes more competitive and the future looks bright in all respects. Shakira Westdorp (Starboard) from Australia burst onto the World Tour this year back in February with a breakout performance at the Turtle Bay Women’s Pro, finishing in 2nd place. Coming into this event here in Huntington, she was therefore in real Title contention. 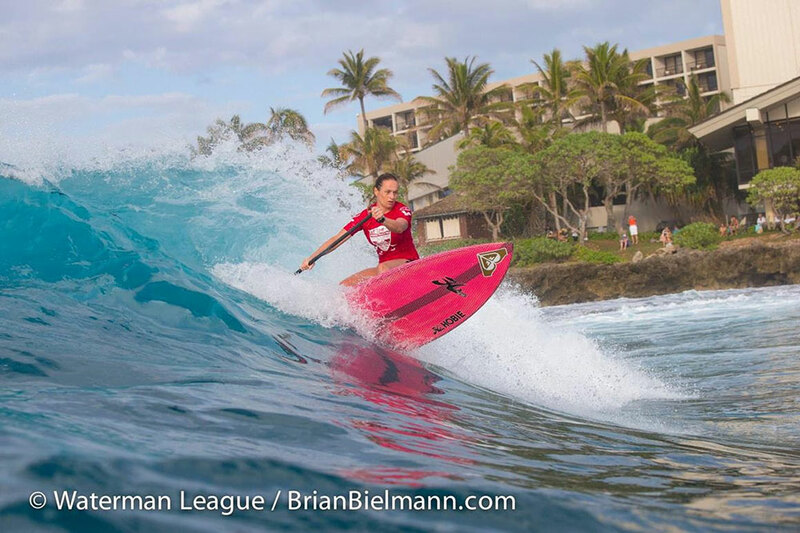 In the early rounds, she was one of the stand out surfers of the event, but faltered in the quarterfinals at the hands of an on form Candice Appleby (Infinity), ending her Title hopes for 2015, but once again showing that she is a major force to be reckoned with on the global scene and a real Title Contender. Caroline Angibaud kicked off her 2015 season in epic fashion at Turtle Bay with a well deserved victory, setting her up well for the year, especially in view of the shorter season. Coming into the final event here in Huntington, she was feeling good, and her boards were working well, but a few mistakes in the first round, followed by an awkward fall which twisted her ankle threw her off, causing her to have to go through the repechage round. This was a heat she was unable to come out of, ending her World Title hopes for 2015. However her win in Turtle Bay was enough to secure her a podium finish here on the Stand Up World Tour, as Caroline posts a very credible 3rd place overall for the year. There is no doubt that Caroline is a force to be reckoned with and continues to be a real contender on Tour. Watch out for Caroline in action next year as she returns to Turtle Bay to defend her Event Title and kick off a new World TItle Campaign. Previous articleChums Waterproof Cases For Your Sup Adventures!